We have decided to reduce our high ambitions in Pulsedrive and focus on the development of [w]tech. All assets for the alpha are finished and we work on the last points on our todo of [w]tech to make Pulsedrive possible. However there will be no further version after the alpha - so we don't call it alpha anymore. As a very small team we have to use our energy in a responsible way and should not 'waste' it in a far to big second or third project where the first one is big enough. This does not mean that we will reduce our efforts to create a great game! As already said we are developing a controller which uses the integrated Bullet-Physics. It depends on this controller whether there will a good gameplay. We are using state-of-the-art effects like Filmic Tonemapping and SMAA for Pulsedrive! The whole world around the track is active. Day and night cycle, glowing balloons and gameplay...scripting is the key for creating a game. As you can see there are no big projects but [w]tech on our list. This enables us to focus on our core idea to make a great game-engine and editor. Least but not last we are proud to show you a in-game shot of our first track. Still in progress! New antialiasing and exponential HeightFog were integrated into [w]tech to provide state-of-the-art graphics! 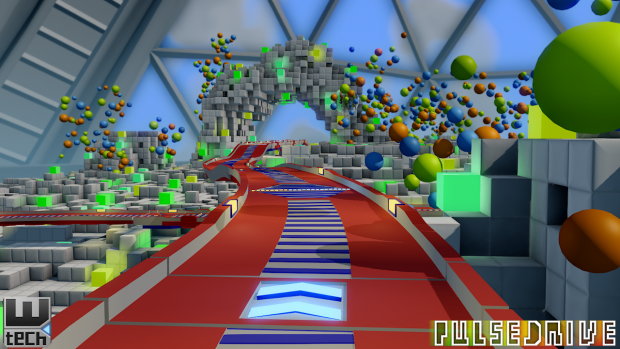 After a long period of working we have nearly finished the environment for our prototype Pulsedrive Alpha! [w]tech - Simple Motion-Blur and "Level of Detail"
That engine is really good. Questions: Will it be available to download ? Can we create FPS with it ? Thanks! We do not have an releasedate for the engine yet, but of course you can create FPS with it. Looks good but what will really "sell" the engine will be the UI and great modern features . Look at UDK , it has even a particle editor , cinematic editor , and a limited visual scripting system . Keep it up because it really looks great until now . This all looks very promising, however I have a question. How are you guys planning on working with UI? Do you have plans to make a detailed UI editor that allows users to place let's say, hud elements with screen ratio with a click of a button? That would be something interesting to see. At first UIs will be done in code only, but an UI-Editor is already planed. 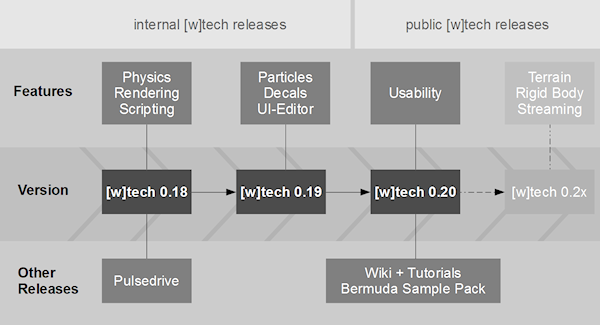 If you take a look at our roadmap you can see it below version 0.19.
what did u guys use to make this engine?this u use any graphics library or something?this enngine is interesting im tracking!!!!!!!!!!! !